Size: G 1/2" to G 1 1/2"
• FRL units for filtering, regulating and lubricating the compressed air. • Port connections from 1/8" to 2". • Modular configurations, metal bodies and metal bowl guards. • Pressure switch block and 3/2 NC solenoid valve. • Automatic drains, by floater or by timer. Micro can offer wide range of pneumatic cylinders for varous industrial automation applications. Pneumatic valves according to ISO 5599/1 and VDMA 24345 standards. Sizes 1, 2 and 3 with connection ports from 1/4" to 1/2". Single sub-base or manifold connection. Electric command with CNOMO interface and bi-stable manual override. 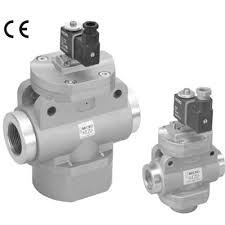 • Valves to operate signals or actuators. • Ports from M5 to 1/2". • Command panel mounting valves with bayonet assembly. 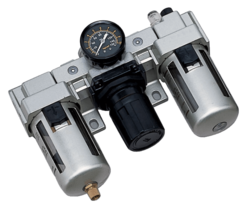 Micro can offer wide range of auxiliary valves for pneumatic applications. Inline connection valves and solenoid valves. • Minimum dimensions with maximum flow rates. • Rational solutions to configure manifolds and intelligent valves stations. • UL or CE homologated solenoids. Looking for MiCRO Automacion ?